An assortment of natural wood trays that hold our Standard Cat Scratching Pads, Deluxe Cat Scratcher Inserts and Super Sleeper Cat Scratcher Inserts. Wood Scratcher Frames There are 9 products. Triple the scratching! 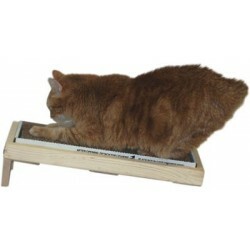 Great for multi-cat home and vigorous scratcher. Sturdy tripod-design. Comes with wood frame, 3 deluxe inserts, and our famous 100% pure Cat Claws Naturally Nip Catnip. Mount this scratcher on the wall to save space. You can easily replace the scratcher insert without removing the wood frame from the wall. Includes wood frame, deluxe insert, catnip, and mounting hardware. 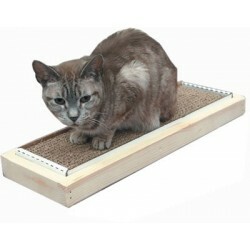 Replace your ragged scratching post with one you can refill so it's like new! 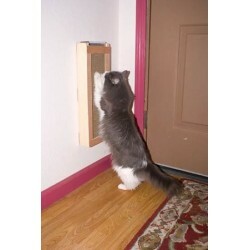 An upright scratcher for those kitties who like to stand on their hind legs to scratch. Comes with our famous 100% pure Cat Claws Naturally Nip Catnip. 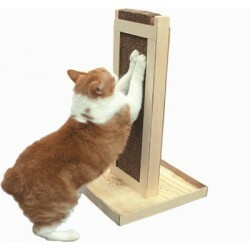 Double Tray Cat Scratcher Combo turns our standard scratching pads into cat furniture. 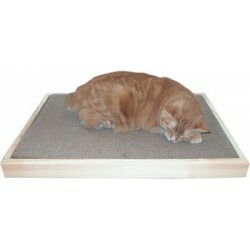 The double tray holds two scratching pads (item #1000) for an extra-wide scratching surface. This wall mounted frame holds our Standard Scratching Pad (item #1000) firmly in place so energetic cats can do some serious scratching. This hefty wood tray holds the Cat Claws Scratching Pad (item #1000) firmly in place so energetic cats can do some serious scratching! Made in USA!! 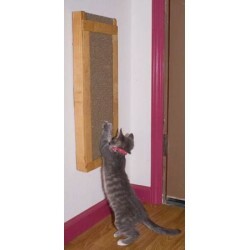 Turn the Cat Claws Scratching Pad (item #1000) into an attractive piece of cat furniture with our Single Climb N' Claw Scratcher. 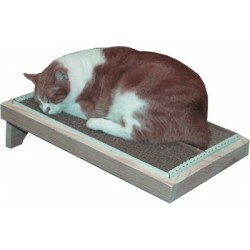 Angled frame holds one scratching pad like a ramp for your cat to scratch on. Scratching pad included. Made in USA. 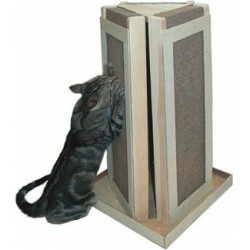 Elevated wood frame holds two item #1000 Cat Claws Scratching Pads (included). Fun for scratching, sleeping, and playing. Made in USA! Our biggest wood-frame scratcher! Big enough for your cat to stretch out and relax and great for scratching. Easy to replace the scratching insert when it's worn out. Comes with wood frame, super insert and our famous 100% pure Cat Claws Naturally Nip Catnip.